If you’re going on a ski trip and have never hit the slopes before, the best advice you can take is to sign up for lessons. Having an expert at your side can make all the difference in your mountain vacation. 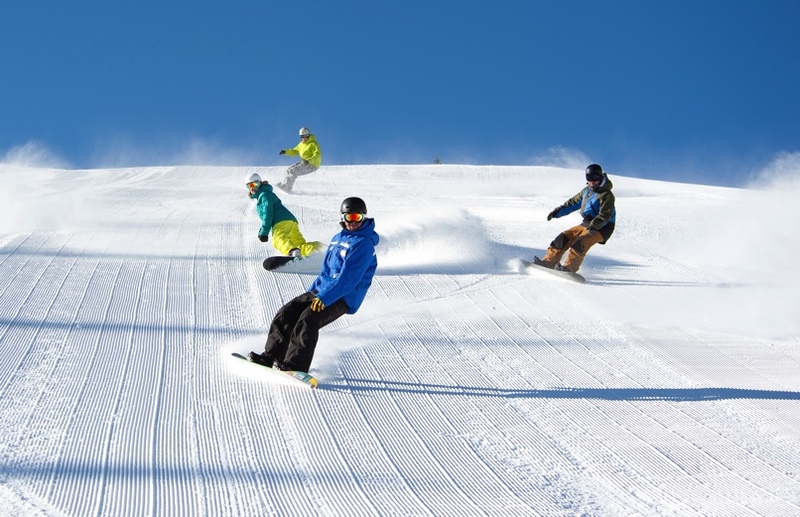 However, there is a range of different options out there, with every resort and ski hill offering something different. For all you first-timers, here are some things to think about to help you determine what kind of lesson is best for you. The first question you should ask yourself is what kind of learning environment you thrive best in. Are you comfortable with a big group, or are you better one-on-one? Like a classroom, group lessons involve one instructor and anywhere from 5-10 students, depending on the resort. Luckily, most ski areas try to keep a decent ratio, so it’s easier to manage for the instructors, and everyone gets the attention they need. Group lessons are great for individuals who want to learn the basics and meet new people in the process. They can be a lot of fun, especially since everyone is going through the same beginner struggles. Private lessons are great for people who want something a little more personalized to their skill level and style. These are perfect for beginners who don’t want to get lost in the crowds, or skiers and riders who have some experience but want to advance their skill set. Another bonus is that private lessons don’t have to be for just one person. 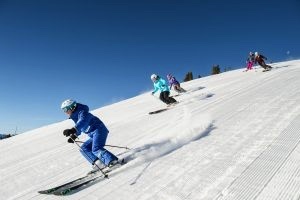 Some resorts offer private lessons for groups of up to five people. This is ideal for families or friends who want to learn together in a comfortable environment. 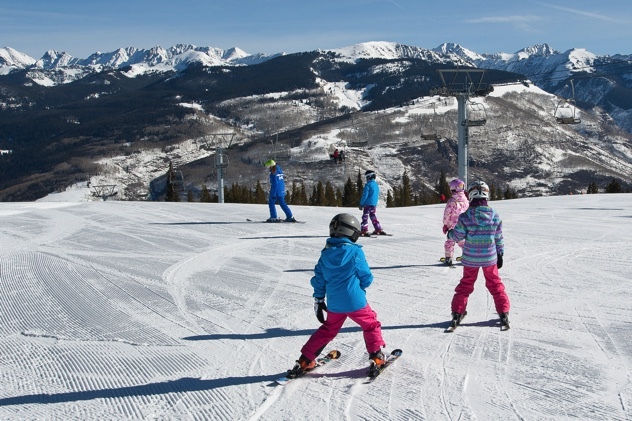 No matter if you’re visiting the West Coast, Midwest or East Coast, nearly every major resort offers group and private ski and board instruction for both children and adults. Once you’ve decided on group or private lesson, the next question you must ask is how long you want your lesson to be. Resorts have a range of options, allowing you to pick the one that best suits your needs. If you only want a few hours of instruction to get the basics down, opt for a half-day lesson. These cost a little less than full- or multi-day lessons and allow you to test your new abilities on your own. Keystone Resort in Colorado offers half-day lessons in the morning or afternoon, allowing you to learn first and then ski on your own, or vice versa. It’s up to you. Now for some, even a half-day lesson may be too long. If you’ve skied or snowboarded before but need a little refresher course, you can book an instructor for as little as one hour at some locations. Stowe Mountain in Vermont offers private lessons for one, two or three hours, while Granite Peak in Wisconsin has one-hour programs for adults and two-hour programs for children. Ski School for the Kids? While some people will sign up for private lessons with their children, there is often a skill imbalance between the generations. In this case, ski schools are the best option. Youngsters get to spend the day with others their age with fun, enthusiastic instructors who are professionally trained to teach children, while their parents enjoy a carefree day hitting more advanced slopes. 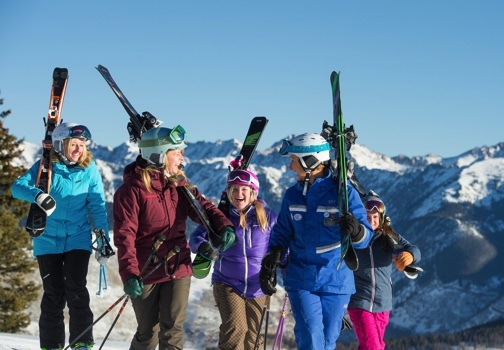 Park City Mountain Resort, Utah provides a variety of different ski school options, from private and group lessons to specialty products for different age groups. Plus, anyone enrolled in the children’s ski school will get more time on the mountain thanks to special lift line access that lets them skip the long lines and go right to the front. or snowboard, or hope to improve their current skill level. Ski school provides a nurturing, challenging and fun environment for them to test themselves, connect with others and learn from experts. So, you’ve decided on the type of lesson you want to take and how long; now you need to book it. Before you make that move, there’s one more thing to consider: a package deal. $100. If you choose to bundle, it drops the cost down to about $90. At Copper Mountain, Colorado, packaging it all together can save you over $150. Many resorts allow you to book all of this conveniently online. If you know the dates you’ll be visiting, simply enter it into the system, select the kind of lesson you want, your rental and lift ticket preference and hit “reserve.” If you have questions or problems reserving online, the resorts provide customer service representatives and group reservation contacts who can help you get exactly what you want. If you know well ahead of time that you want to take a lesson, make advanced reservations. Not only will it guarantee you the time and date you want, but often you can get a bit of a discount, especially if you’re purchasing lift tickets separately. Walk-up window prices tend to be more expensive than buying online, where you can save at least 20% if not more. Pick up your lift ticket and rentals the day before your lesson, as this will save you time in the morning. If you don’t have time the day before, be sure to arrive early to go through the check-in process, fill out liability waivers and pick up all your equipment. You want to have as much time with your instructor on the mountain as possible. Answering a few simple questions can help you determine the best lesson plan for your first ski or snowboard experience. Once you figure it out, it’s all downhill from there.